Templates are useful if you wish to save a specific layout for reuse. Templates can be used within a single company, or shared across the whole organisation. Templates can also be used to create reports for a group of related companies in a consolidated group, or a benchmark group. This is particularly useful for multi-entity and franchise groups. There are two types of templates within the Reports Centre. Custom templates are specific to you or your organisation. These are templates which either you have created or another member of your organisation has created. Predefined templates are report templates created by Fathom. It is not possible to edit a predefined template. 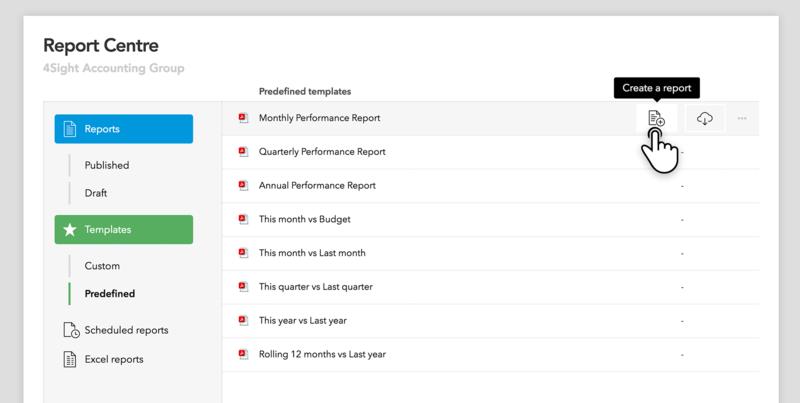 Predefined templates are a great place to start when creating your own report or custom template. 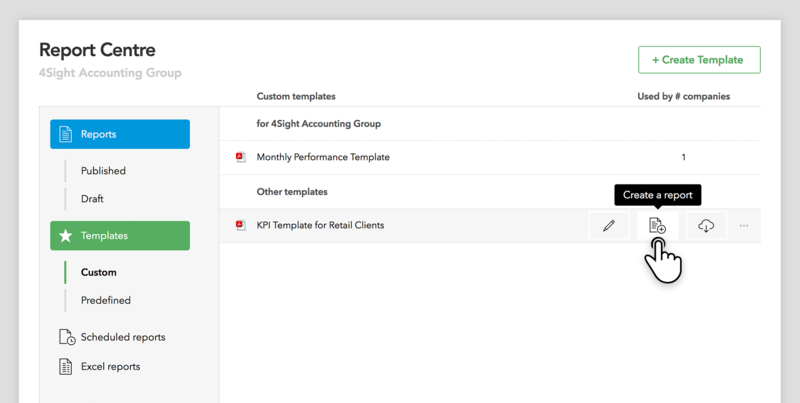 Under the Templates section, select 'Custom' and click 'Create template'. Choose a name for the template, and choose a set of data to design this template. Note: this data is only used to design the template; you will be able to choose whichever data set you'd like whenever you create a report from the template in the future. Next, you will choose a landscape or portrait orientation. This will influence the orientation of the first page of the template. To create a report using a template, click ‘Create Report’ in the Reports Centre. From here, choose ‘use a template’ and then select a template from the drop-down menu. Another way to achieve this is to go to the ‘Templates’ section, hover over the desired template and click ‘create a report’. Templates shared with 'All companies and groups' can be found under the 'Other templates' heading in Custom Templates. Click 'Create a report' to quickly generate reports for one or more companies. To use an existing template as a base for creating a new template, click the overflow menu next to the template (3 horizontal dots) and select 'duplicate template'. The duplicated template can then be tailored. It is possible to duplicate both predefined, and custom templates. If you edit a template which is shared with or used by other companies in your account, then any changes will impact the reports created using this template for these companies also. 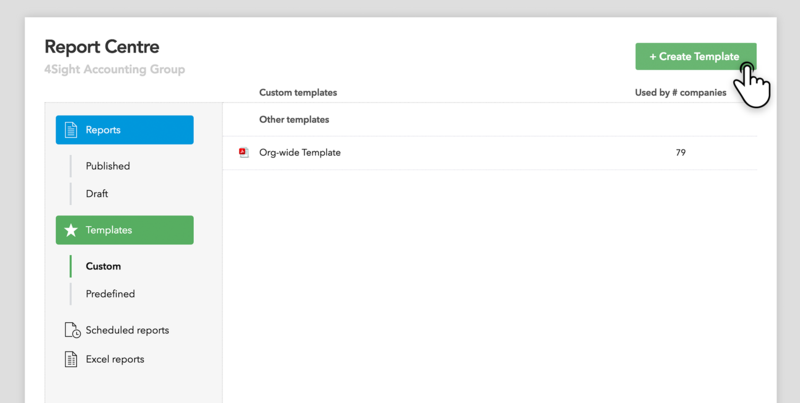 Using the overflow menu, you can select a range of options for a custom template. The 'template sharing' settings allow you to select who can see, edit and use custom templates. These settings can be found when hovering over the custom template and selecting 'template sharing' from the overflow menu. Custom templates can be shared with other companies in your Fathom account, by clicking the overflow menu next to the template (3 horizontal dots) and selecting 'edit template sharing'). From here, you may select to share the template with 'all companies and groups' or only certain benchmarking groups of companies. Which users can edit custom templates? Just me (only available for the creator of this template).